An imposing and historic house on the outskirts of Market Lavington is reopening as a hotel at the beginning of March. Though Mr Stewart Reynolds is continuing his long-standing ownership of Clyffe Hall, it will now be run under the joint management of his great-niece, Miss Jacqueline Reynolds and her fiancé, Mr Bill Stephens. The hotel, which has the informal atmosphere of a country house, will cater for conferences, wedding receptions and parties, and the restaurant will offer dinner in the evenings. Clyffe Hall- has an interesting history. 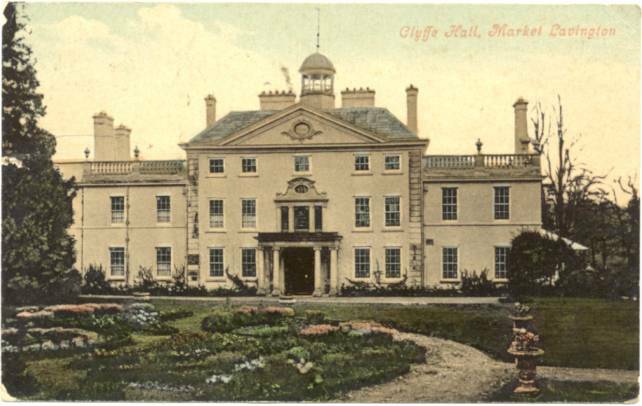 Built in 1732 by a Gloucestershire man, Edward Chivers Vince, it was originally a fairly small elegant Georgian mansion, set in 20 acres of land, and approached by an avenue leading from West Lavington High Street. An inventory of 1752 describes the house as having one elaborate plaster ceiling, a hall, drawing room, tapestry room, best parlour, and two little parlours, a yellow, green and red room, and a best room. Edward Vince was succeeded by his son, and the house was then let for a number of years. By 1814, the copyhold had been surrendered, and Lord Radnor, who died in 1828, left Clyffe Hall to his son together with other land in the parish, amounting to 512 acres. Edmund Schomberg bought Clyffe Hall in 1898, and during the early years of this century, the north front was decorated, and the interior remodelled by Sir Ernest Newton. In 1905 the estate was bought by Sir Thomas Rolls Warrington, later Lord Warrington of Clyffe, and he added the billiard room on to the east wing. It was during Lord Warrington’s time that the magnificent grounds were laid out under the direction of William Goldring, a well-known landscape gardener, and there is a sole survivor who has many happy memories of those times. Mr Jim Hurkett, of 53 Longcroft Road, Devizes, Spent twenty-one years as gardener to Lord Warrington. A colourwash postcard of Clyffe Hall, Market Lavington in about 1914. This was during Lord Warrington's tenure of the house. Mr Reynolds, who bought Clyffe Hall in 1938, offered it as accommodation during the war to the instructing staff at the Senior Officers’ School at Erlestoke, and when the war ended, he converted it into a hotel. Mr and Mrs Reynolds now live in the fine 18th century stable building, which has been converted into an attractive house. This entry was posted on November 28, 2011 at 6:05 am and is filed under Museum. You can follow any responses to this entry through the RSS 2.0 feed. You can leave a response, or trackback from your own site.